sshreach.me is ideal for administering one or more servers which are behind the firewall. Once the clients are installed, the tunnels to the servers can be opened and closed remotely through the web interface. The ssh server on the target machine must be up and running. The client should be opened on the port that ssh server is configured to listen to (typically port 22, but you should check your 'sshd_config' file). From here, you can just copy and paste the command to your terminal to connect to the server once the tunnel is activated. Click on the Script tab and from there you can download your activation script. Once your activation script is downloaded, you can start it with the following command: python sshreach.me /path/to/your_private_key. 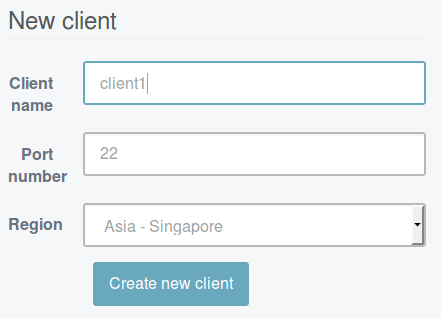 Once the client is activated, the client name will appear in green with a check mark next to it. You can now activate your tunnel through the web interface, by clicking on the Actions tab and switching the button to On position. You can close the tunnel by switching the button to Off position.